During our recent trip to Dublin in October, I had the honor of teaching a class on the history and development of Mr. Parker’s Kenpo. I attempted to convey a sense of how the Art had progressed from its modern revelation in Hawaii during World War II to the present day. I was lucky enough to be joined by fellow instructors, Professors Richard Matthews, Diane Wheeler, and Kieran Fitzpatrick, who knew and had lessons with Mr. Parker. The vast majority of participants knew Mr. Parker’s Art only through his writing and their contemporary study. Publishing the notes on this class, without the movement and music that accompanied it, would not have been an accurate representation of the learning experience we enjoyed together. Instead, I have chosen to re-publish an article originally printed in the I.K.K.A. newsletter around 1994. I hope by publishing this old article that newer students and instructors will gain greater perspective on the Art we share. I was reminded of the above saying when I read the discussion of the rear bow in a (prior I.K.K.A.) newsletter. This seems and opportune time to relate some of Mr. Parker’s thoughts concerning the rear bow which he chose to share with me, Keith See, and others at my home in New Orleans around 1987. 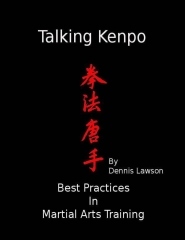 Prior to the publication of Infinite Insights Into Kenpo (Volume 2) Physical Analyzation 1, Mr. Parker decided that the emphasis on the rear bow in such techniques as Thrusting Lance or Returning Storm was “unuseful” (his words). Introducing a different stance added unnecessary complexity to techniques (defenses against weapons) that were “case studies” of life threatening situations. He considered the rear bow or Kokutsu dachi (Japanese term) as he called this stance during our discussion, a vestige or hangover from more classical movement. Mr. Parker felt it increased target exposure (lower body) and limited the practitioner’s Margin for Error. The continued inclusion of the rear bow was counterproductive in developing this kind of “kinesthetic experience” of the neutral bow. This discussion serves as an example of many of the present (circa 1994) problems of our system --- The Ed Parker System. Before his death, Mr. Parker established concrete requirements for Black Belt ranks from first to eight degree in the Ed Parker System. Now we see black belts with advanced degrees in Kenpo everywhere. How many are inspired by Mr. Parker’s tireless commitment to excellence, his enthusiasm for a new point of view, his true and honest humility in the face of all he had accomplished? Mr. Parker often referred to himself as a “student” of the art (Admittedly, a very advanced student). My question then is where are the “students” who will continue his passion for excellence in the art of Kenpo?